FILE - Fighters from the Kurdish People's Protection Units and Free Syrian Army's Al-Tahrir Brigade gesture while posing on the Syrian-Turkish border Tel Abyad of Raqqa governorate after they said they took control of the area, June 15, 2015. A top Syrian rebel commander coordinating with the Kurds in the fight against the Islamic State group in northeastern Syria confirmed that his forces last week received a substantial airdrop of small arms from the United States. And, contrary to U.S. Defense Department comments, he said the American-supplied weapons and ammunition are being divvied up with the Kurds ready for an assault on the jihadist capital of Raqqa. The new unit has a combined force of about 20,000 fighters. The Arab and Turkmen militias have officially named themselves the Democratic Forces of Syria. 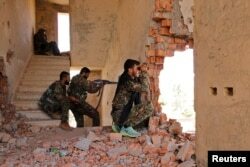 FILE - Kurdish People's Protection Units (YPG) fighters monitor the movements of Islamic State fighters who are stationed nearby, from a damaged building in al-Vilat al-Homor neighborhood in Hasaka city, Syria, July 22, 2015. Last week, Turkish Prime Minister Ahmet Davutoğlu warned publicly the U.S. and Russia, which has been courting the YPG, against arming the Syrian Kurds, saying such a move would threaten his country’s security. The YPG is an offshoot of the outlawed Kurdistan Workers’ Party, or PKK, and Ankara fears territorial gains by the Syrian Kurdish militia along its borders will fuel separatist Kurdish ambitions in Turkey. A cease-fire between Ankara and the PKK collapsed in July, triggering a resumption of hostilities in the decades-long struggle between Turkey’s Kurds and the Turks. Pentagon spokesman Colonel Steve Warren told reporters in Washington on October 12 that the 50 tons of supplies airdropped by a U.S. Air Force C-17 cargo aircraft reached “Syrian Arab groups whose leaders appropriately were vetted by the United States and have been fighting to remove ISIL [Islamic State]." U.S. officials also said the Obama administration hadn't authorized the Pentagon to supply ammunition and weapons directly to YPG fighters. Last week’s supply run was the first the U.S. has made in northeastern Syria since October 2014, when arms and ammunition was airdropped to YPG forces defending the besieged border town of Kobani from Islamic State militants. 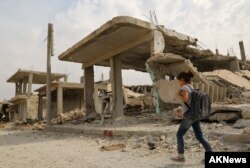 FILE - Syrian children walk past debris while heading to school on the second day of the new school year on Oct. 6, 2015 in the Syrian Kurdish town of Kobani. In the face of Ankara protests about U.S. assistance to the Syrian Kurds at Kobani, U.S. Secretary of State John Kerry said it would be “morally very difficult” for Washington to turn its back “on a community fighting IS as hard as it is." Washington has struggled for months to "square the circle" between Ankara and the YPG, and its associated Syrian Kurdish Democratic Union Party, the PYD. Turkey joined the U.S.-led campaign against the Islamic State group only after nearly a year of painstaking negotiations and a July bombing by the jihadists in the Turkish town of Suruç that killed 33 people. While keen for Turkey to step up its role in the fight against the jihadists, U.S. military officials view the YPG as the international coalition’s most capable partner on the ground in the struggle against Islamic State militants. A key demand of the Turks is that the YPG and associated armed groups do not cross west of the Euphrates River to establish contiguous Kurdish-controlled territory along a large stretch of the 900 kilometer Syrian-Turkish border from Iraq in the east to the mainly Kurdish town of Afrin. Before the war, Syria’s Kurds were concentrated in three separate enclaves adjacent to the border. But in the interview with VOA, Sellou did not rule out ignoring the Turkish demand to keep to the east of the Euphrates, and he said his forces and the YPG may cross the river to battle the jihadists.